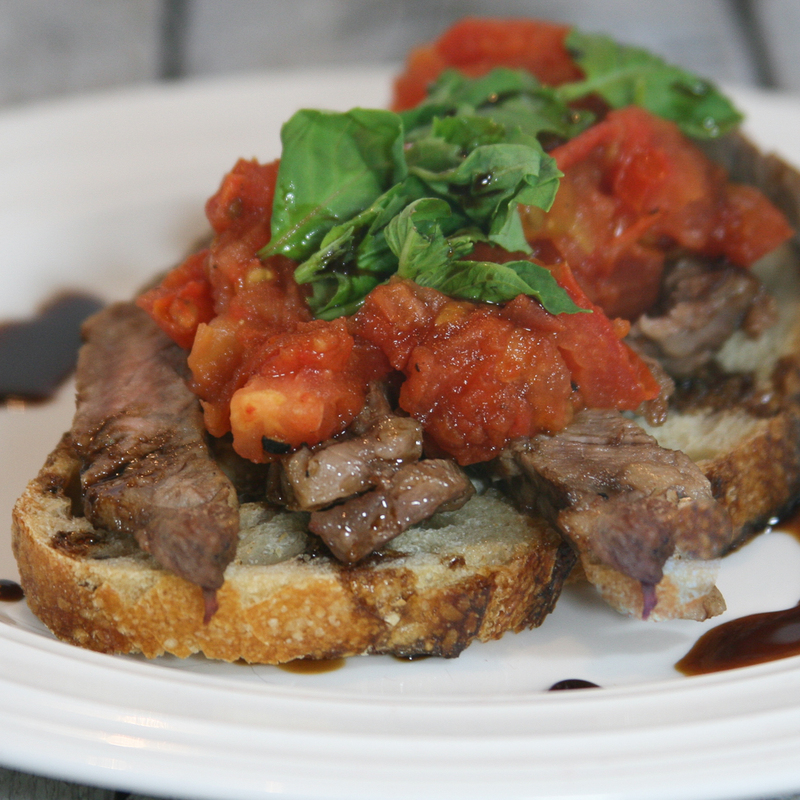 Steak and Tomato Stacks | Relish! Tonight’s dinner menu features tomato, basil and grilled rib eyes with a drizzled balsamic vinegar. Heat a large nonstick skillet over medium-high heat. Coat pan with cooking spray. Add tomatoes; cook 4 minutes, stirring occasionally. Stir in salt and pepper. Remove pan from heat; cover and keep warm. While tomatoes cook, sprinkle steak with salt and pepper. Place steaks on grill rack coated with cooking spray. Grill over direct medium-high heat until cooked to desired doneness, 810 minutes for medium-rare, turning once. The internal temp for medium-rare is 145 degrees. Cover and let stand. While steak stands, add bread slices to grill rack; grill 1-2 minutes on each side until toasted. Cut steak into thin slices. Place 1 toast slice on individual plates. Divide tomato mixture among each and layer steak over top. Drizzle each serving with vinegar and garnish with fresh basil.